Profore Multi Layer Compression Dressing Bandage System from HealthyKin.com contains a unique concentration of bandages to provide approximately 40mmHg pressure at the ankle, graduating to 17mmHg at the knee. Proven effective in both hospital and community treatment studies, Profore is designed to deliver 40mm Hg pressure at the ankle, decreasing to 17mm Hg at the knee. Profore provides higher pressure at the ankle, with decreasing pressure exhibited at the calf. 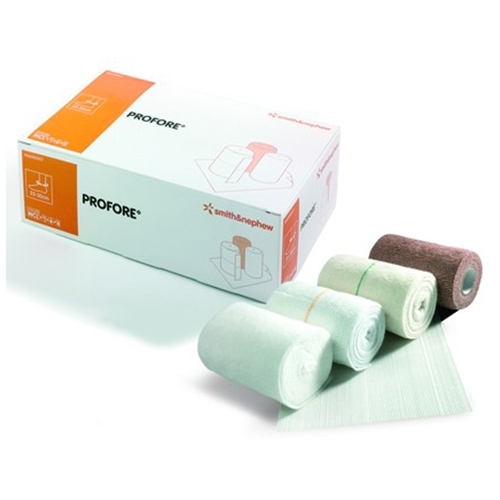 Even up to a full week after application, Profore maintains effective levels of compression. Profore pads bony prominences for protection and through the use of layers, compression is built up gradually. Profore has sufficient absorption capacity to manage exudate for up to a full week without needing re-application. Weekly dressing changes greatly reduce the nursing time required for the treatment of venous leg ulcers. Studies have shown that the multi-layer compression bandage system provides significant savings in treatment costs. Profore system packs contain everything necessary for the application of effective graduated compression therapy. Profore reduces preparation time, simplifies stock control and ensures that the correct components are always available. This is the best possible product for healing venous stasis ulcers. Some say UNNA's boot but those get stretched out early on. Profore keeps on working and the week's worth of wear makes it a cost savings. The Profore 4 layer system is the same as the hospital I go uses. It's the best price I've found of any multi-layer compression bandage. I have suffered with venous ulcers for 10 years. This is the ONLY product that works for me. I can apply the dressings myself and just have follow-up with my doctor. I highly recommend this product!! Great, simple way to streamline the procedure for weekly changes. the best price you can find over the net is at www.healthykin.com. Skip the costly co-pays and grief at your local wound center - do it yourself. These can actually go 4 weeks without a change. This product is what the wound clinic uses, and it's so easy! The cheapest price I've found, fast shipping, Healthy Kin is the best! This is exactly the same as the wound care clinic used on me, the quality of products are excellent. I highly suggest if you need this type of product to purchase this. Works very well. Healthy kin gave timely delivery.